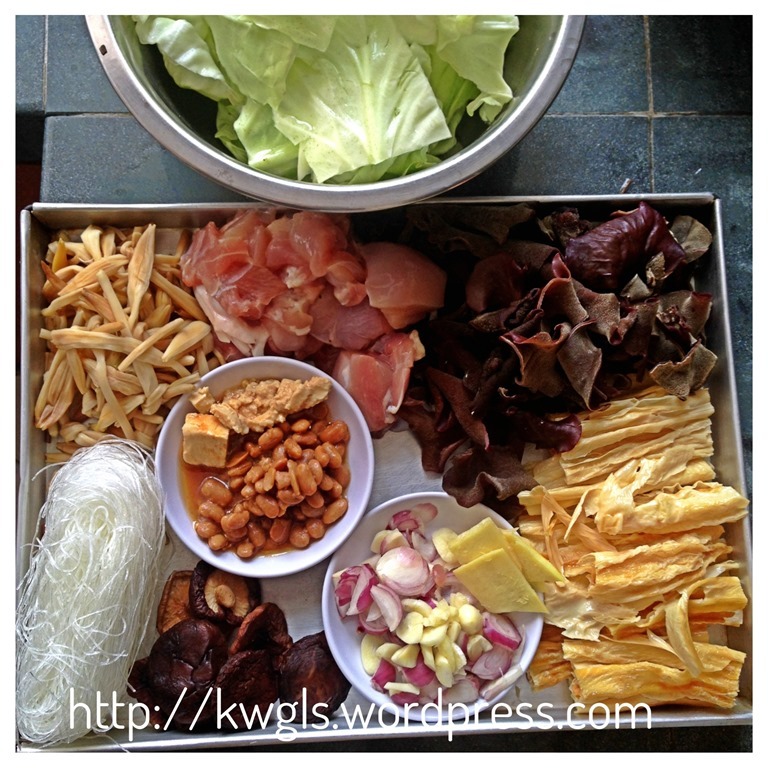 I have quite a number of savoury dishes recipe with me but not issue yet and I usually only issue savory dishes recipe on weekends or public holidays because it is a bit tedious to write the recipe especially the ingredients. I am sharing this childhood recipe of mine that my late father used to cook. 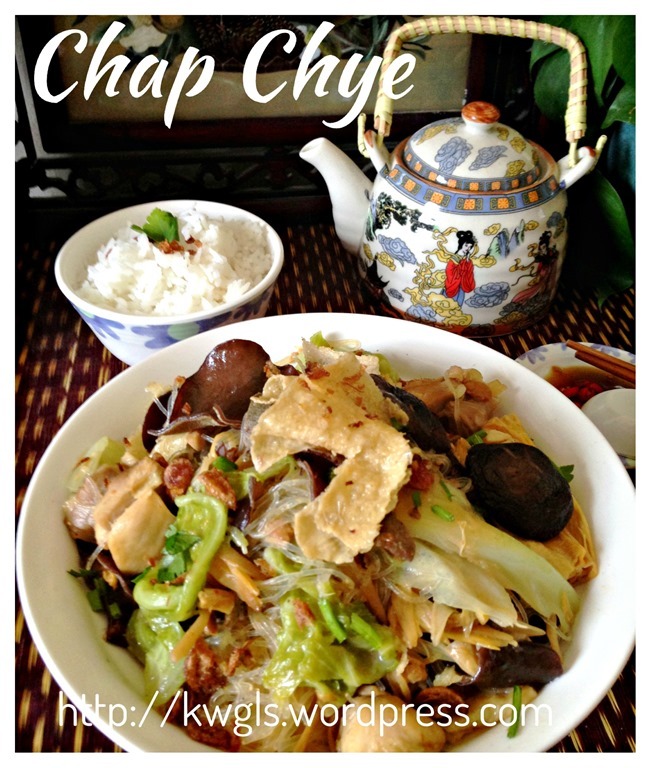 This is a mixed vegetable stew or Chap Chye. 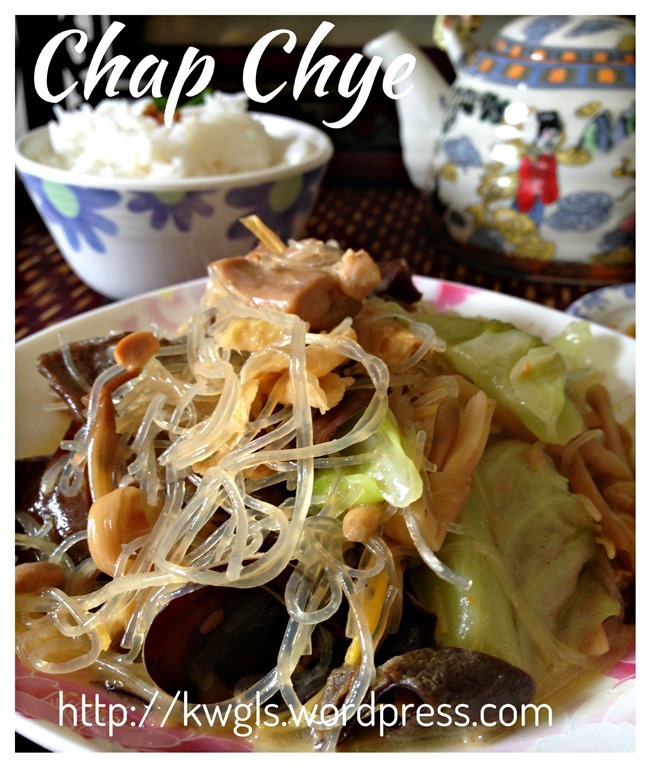 The name “chap chye” literally translated as “mixed vegetables”. 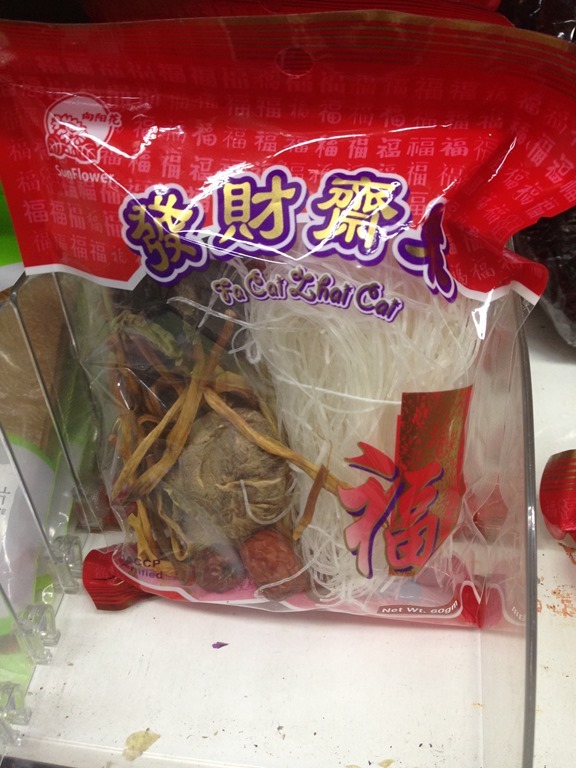 When I was young, usually, after certain religious praying festival in the temple, my parents would brought back a packet containing 5-6 vegetarian cooking ingredients typically consist of glass noodles, bean curd sticks, black fungus ear, black mushrooms and lily buds. He then soaked all these ingredients in the water for a few hours and start either stir fried them or boiled them as soup dish with this. Therefore, this dish is never new to me and I can prepare the dish without referring to any recipe.. It is a dish that grows up with me. 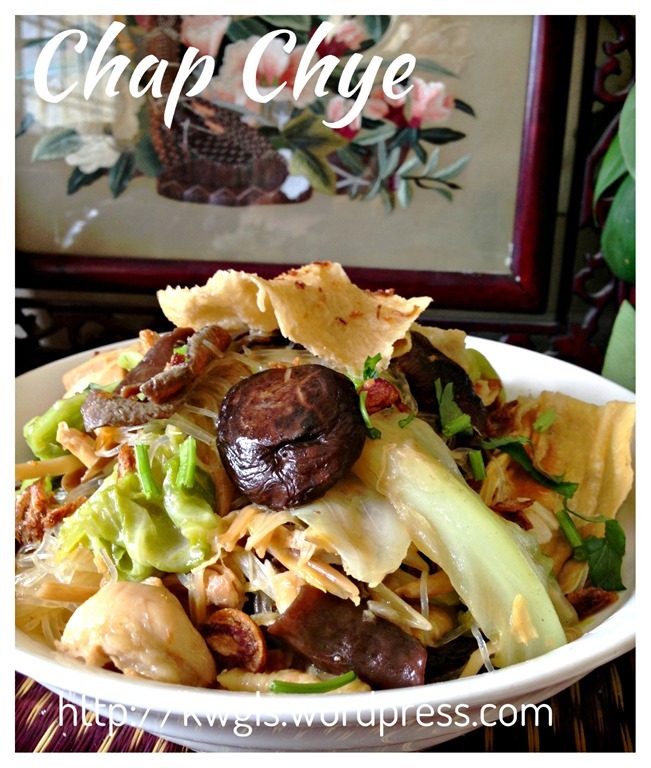 Having said that, when I searched for Chap Chye recipe in the internet, I discovered that my way of cooking is very much similar to the recipe listed as “nonya chap chye”. Both my parents were from China and being in Sarawak, they had very limited contact with the Peranakan community since in Sarawak, there are very few Peranakans. 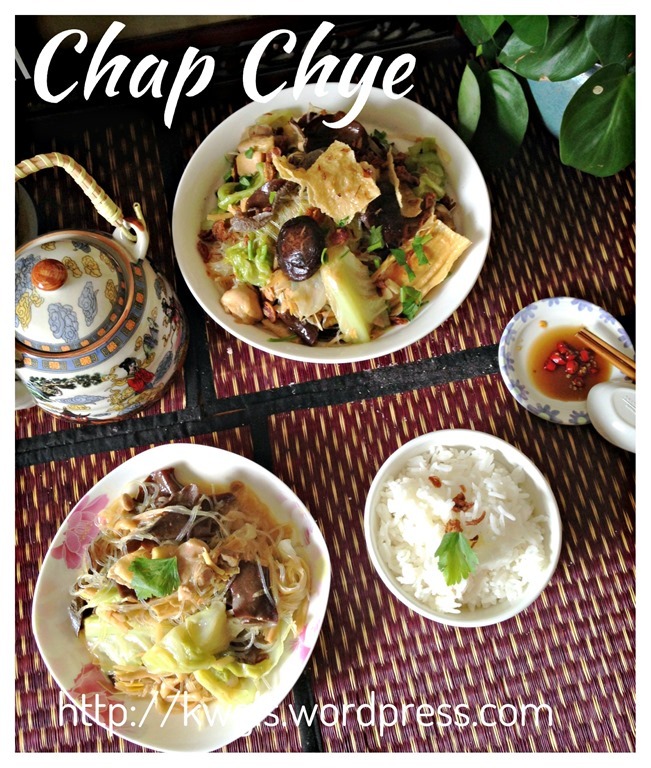 Though this method of cooking is very similar to the Peranakan chap chye, I will not list this recipe as a Nonya dish as we do not eat this dish with belachan like the Peranakans. 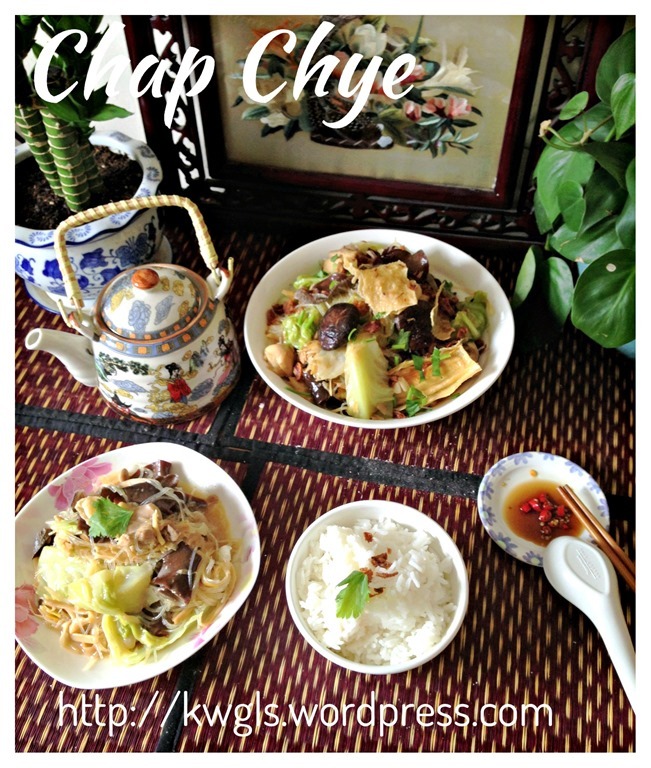 I am sharing two versions of chap chye recipe, the non-vegetarian version and the vegetarian version. 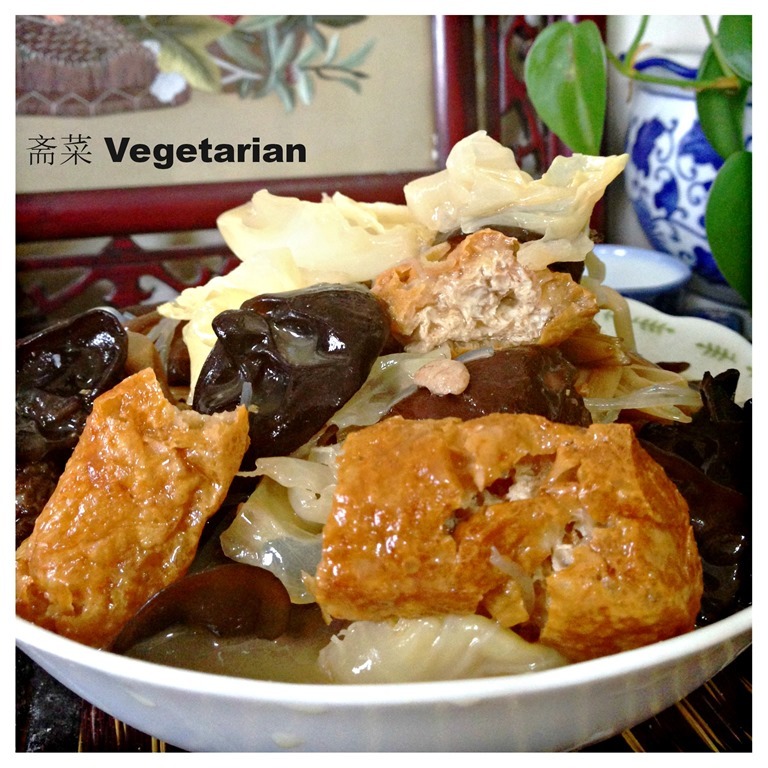 For the illustration, i have used the non vegetarian version which include meat and garlics. As this is a very flexible dish, all ingredient’s quantities listed here are for reference. A bit more or less is acceptable. 3 tablespoons of cooking oil. * All quantities here are listed for reference, feel free to adjust to suit your taste bud. In a frying pan, sauté the shallots ginger and garlics until fragrant and almost golden brown. 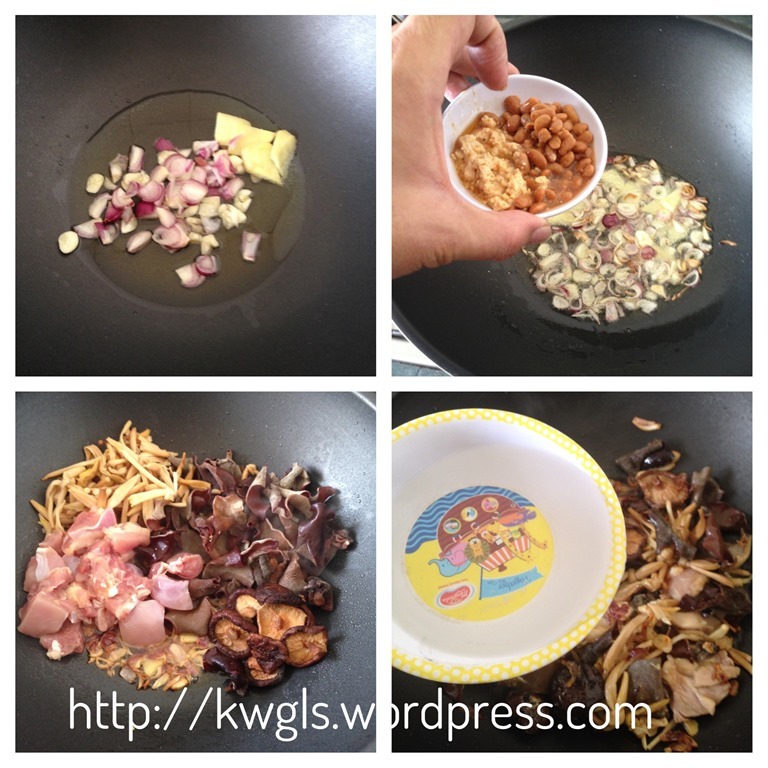 Add the fermented bean curd and fermented soya beans. 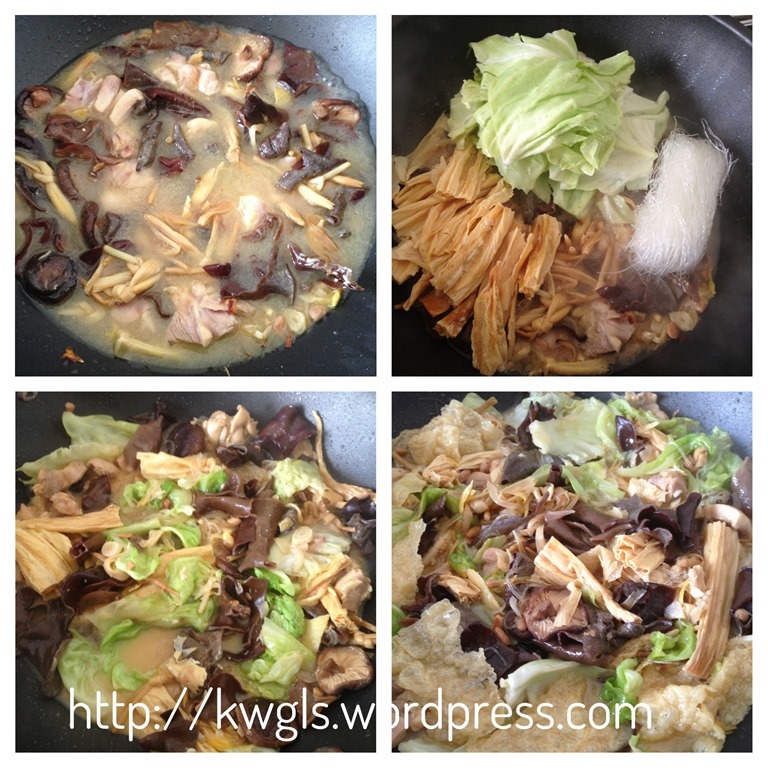 Stir fry for 1 minute and add ingredients in this manner: meat, mushrooms, black fungus ear and lily buds. Stir fry for 3-4 minutes, Add some water just enough to cover the ingredients, bring to boil and let it simmer for 2-3 minutes. 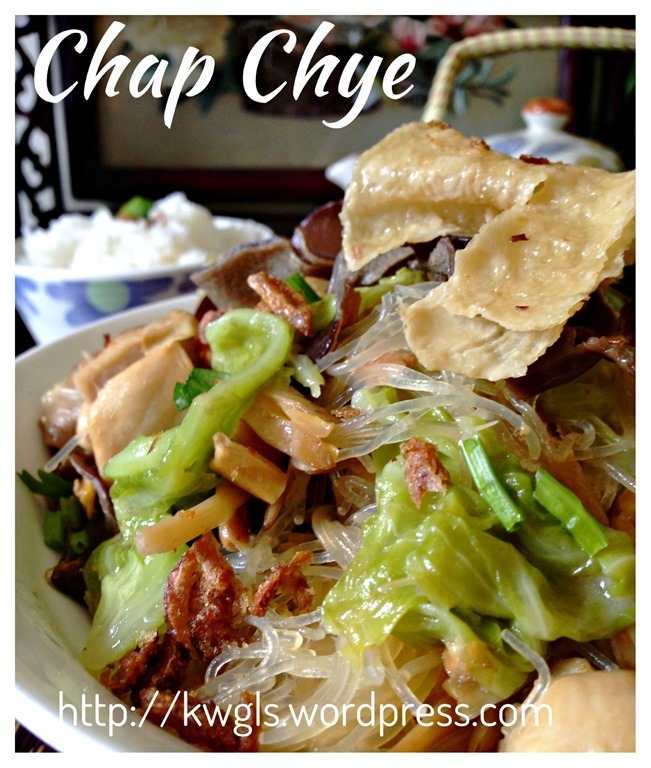 Add the cabbage, bean curd sticks, dried bean curd (tau pok) and followed by glass noodles. Stir fry for 1-2 minutes. Add more water to cover the ingredients. Bring to boil, add seasonings (light soya sauce, sesame oil, sugar or preferred seasonings) . Let it simmer until your preferred texture. 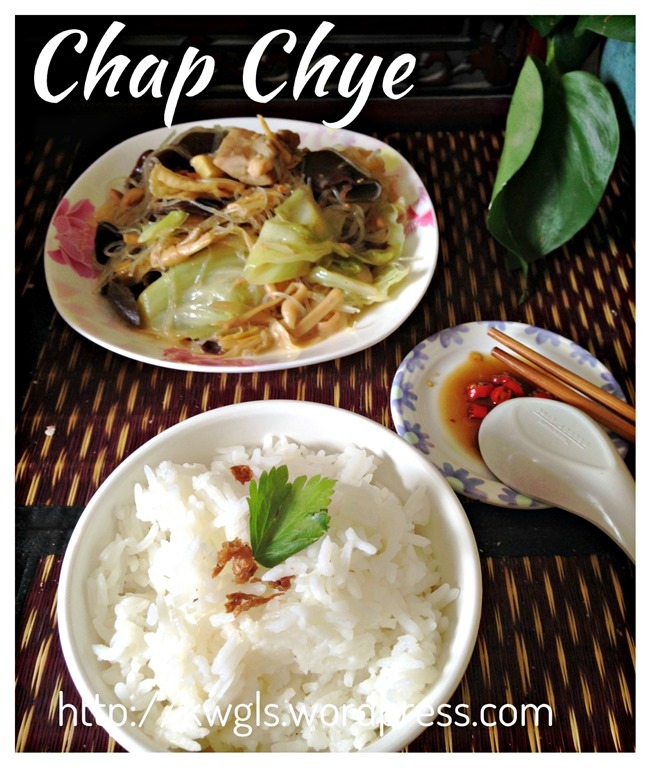 As I preferred my chap chye to be a bit chewy, it took me about 15 minutes to simmer this. For those who like the melt to the mouth texture, you can transfer to the slow cooker and let it slow cook for 3-4 hours. For vegetarian version, just ignore the meat, shallots and garlics. 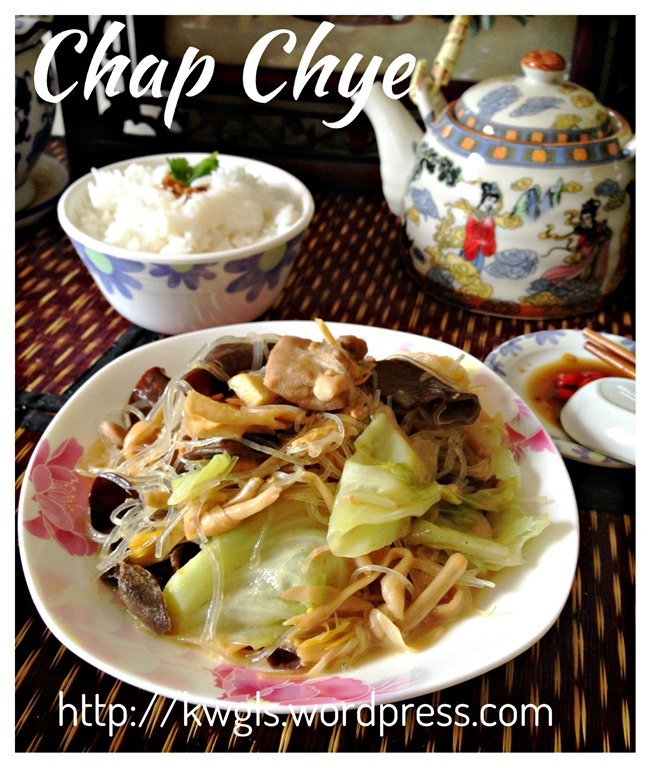 Ginger is essential in this recipe as it helps to prevent gastro intestinal system of producing gas by taking too much of bean products and cabbages. You can also use the same recipe to boil into soup by adding pork ribs. It is very delicious too. As this is a very common dish, I am sure most household with have their way of cooking. 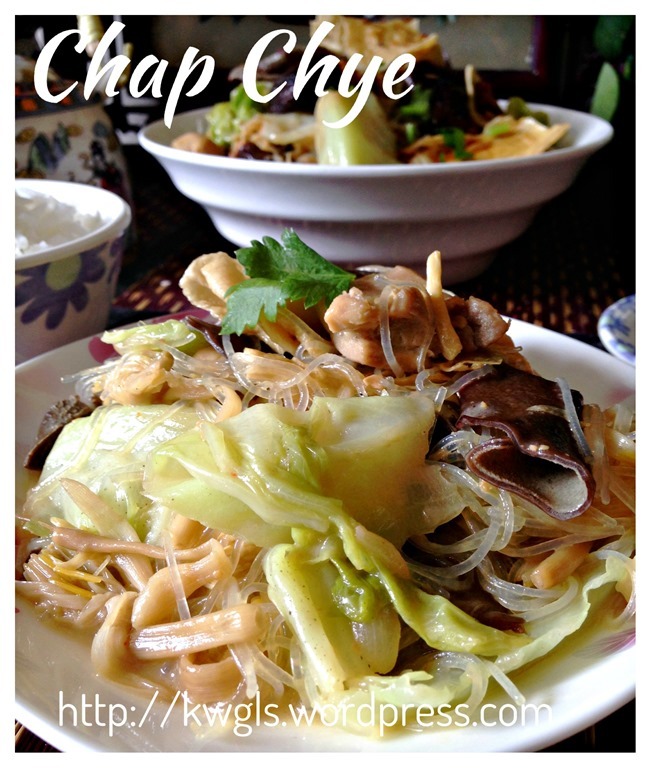 For me, what make me love this dish is the different combination of dried vegetarian ingredients and most important of all, the flavour of cabbage, lily buds, fermented bean curd and fermented soya beans. Without these few ingredients the taste will not be the same…Other than that, feel free to add the type of ingredients that your family likes or used to eat.. 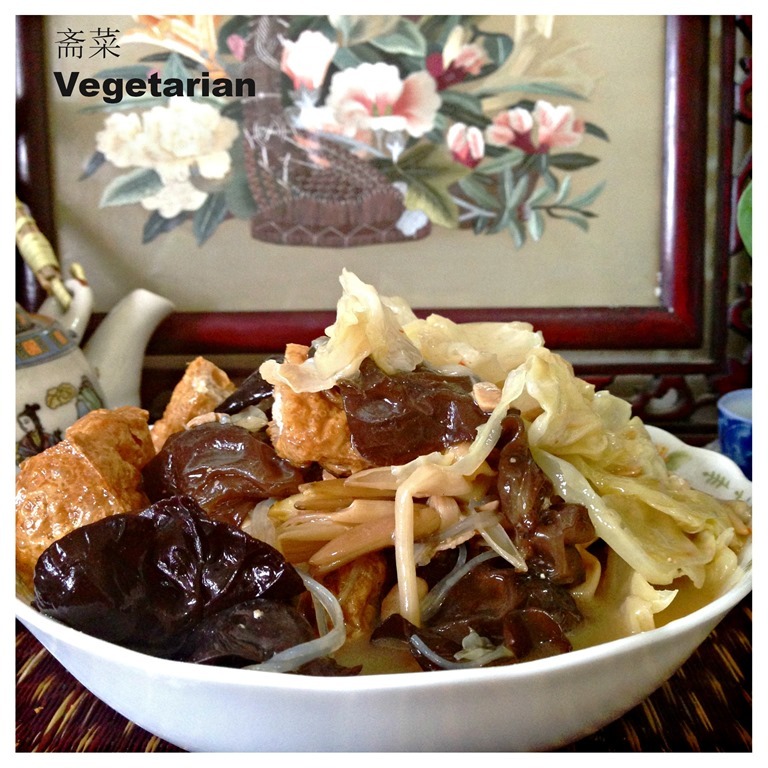 This entry was posted in Dish, Food Preparation Series, Vegetarian and tagged chap chye, GUAI SHU SHU, Guaishushu, kenneth goh, mixed vegetable stew, nonya chap chye, 杂菜汤，罗汉斋，斋菜， 8， postaday. Bookmark the permalink.